Srinagar, Feb 7: Air traffic at Srinagar International Airport remained suspended for the second consecutive day on Thursday due poor visibility and fresh snowfall. 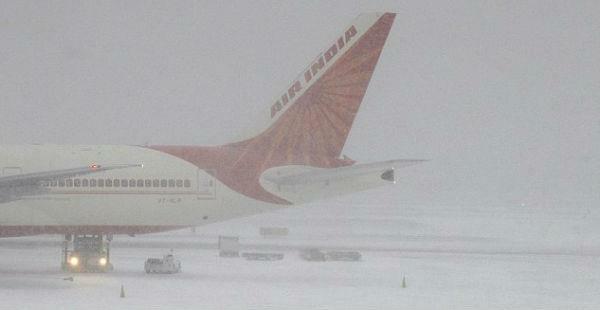 An official of the airport said that no flight could land or take off from Srinagar airport for the second day. He said the runway is under snow which could be cleared once the snowfall stops. However, he said, the visibility is also very poor due to which morning flights were cancelled. Not a single flight could operate yesterday also due to intermittent rain-snow and poor visibility, he said. This was the fourth time air traffic at Srinagar airport was disrupted during the past fortnight. There is also a forecast for wet weather during the next 24 hours in Srinagar. He said air traffic will be resumed only after an improvement in the weather. The Srinagar-Jammu National Highway has also been remained closed for the second day today due to landslides, shooting stones and snow. People alleged that all airlines are increasing airfare once the highway is closed and air traffic is disrupted. Governor Satya Pal Malik has taken the issue of increase in airfare with Prime Minister Narendra Modi during his daylong visit on Sunday, alleging that Rs 24,000 and Rs 28,000 are being charged from Delhi to Srinagar by airlines. Advisor to Governor Khurshed Ahmad Ganie also raised the airfare issue with the representatives of different airlines stationed in Srinagar.